The connectors are color coded to match the ports on your personal computer or notebook, ensuring a simple connection. The charcoal gray cable jacket not only matches your case but disappears behind your desk leaving a clean organized look. The Ultima Series meets the rigid standards of everyday use. The cable is double-shielded with a dual foil and braid. Copper foil wraps the undermold, while a 360-degree soldero-connector shell and cable braid create an endo-end shielding solution for a noise-free connection. This video Y cable has one DVI connector at one end, and DVI and VGA connectors at the other. Note: When using a computer graphics card, the DVI port must be capable in outputing a digital and an analog signal SIMULTANEOUSLY to get two active displays. • Precision-manufactured 24K gold-plated connectors ensure long-lasting picture quality. • Fully molded connectors provide excellent strain relief to keep your cable working reliably year after year. • Send one S-Video output to two locations! Velocity™ S-Video Y-Cable is the perfect answer when the question is "How do I get one S-Video signal to two devices easily and inexpensively?" Low-loss dual 75-ohm oxygen-free copper wire and a foam dielectric guarantee the proper characteristic impedance. Individually double-shielded wires combined with an overall aluminum foil and OFC braid shield eliminate electromagnetic and radio-frequency interference. A dual coax design, a properly manufactured S-Video cable transports the black-and-white picture detail information and the chrominance color information on separate pathways. This construction enables improved picture quality when compared with a typical composite cable. 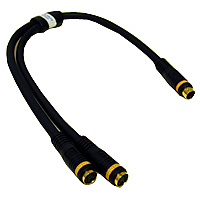 In addition to fitting standard 4-pin S-Video jacks, the performance S-video cable fits most 7-pin jacks found on desktops and notebooks with a TV out jack.